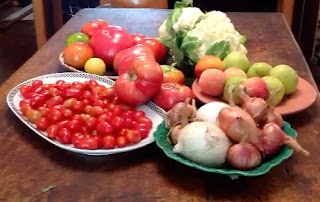 Though the calendar says September, the roses of summer are still on my vines and the fresh produce at our local farmer’s market co-op is at its peak in quality and quantity. We could be deluded into thinking that this will go on forever, but for the fact that clients have begun to call to inquire and book events for this fall and holiday season. We have been hired to cater our first Christmas holiday event of 2012 and while we are still grilling swordfish, making gazpacho and fresh tomato salsas (see recipe); we are planning menus of short ribs and stuffed quail, root vegetable gratins, bread puddings, hot soufflés and Tartes Tatin. This summer/fall is our first as shareholders in a farm co-op. 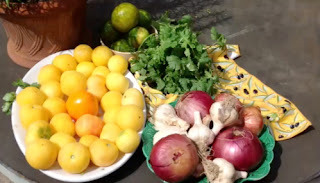 While we normally get most of our produce from various purveyors at the city greenmarkets; we thought that it would be an interesting experiment to supply our summer test kitchen with the produce from a single farm with its specific offerings. This has been a challenge to be creative with only what we are given and has defined the recipes for us. We love our yellow tomato salsa on grilled fish, burgers, as a bruschetta and, of course, with tacos and quesedillas.